Norwich have sacked manager Chris Hughton and replaced him with youth coach Neil Adams. The Canaries were beaten 1-0 by West Brom on Saturday and are five points clear of the relegation zone with five games remaining. They are still to play Fulham, Liverpool, Manchester United, Chelsea and Arsenal. 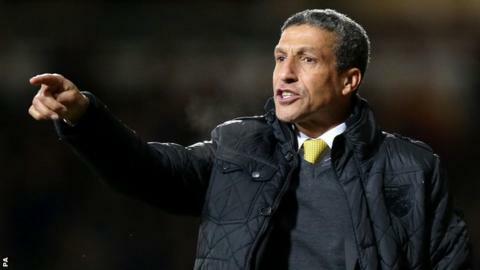 "Norwich have adopted the high-risk strategy for survival by sacking manager Chris Hughton with only five games of the season left. It may be, however, that the Carrow Road hierarchy feel they have nothing left to lose after the 1-0 home defeat by fellow strugglers West Brom. "The Canaries are five points clear of the drop zone but they have a fierce run-in starting with a visit to another side fighting for survival in Fulham, and followed by games against Liverpool, Manchester United, Chelsea and Arsenal - so the scale of the task can be seen. "It is also a sign of the fear of dropping out of the Premier League that a club renowned for stability should take such drastic action at such a late stage, leaving former youth team coach Neil Adams to try to keep Norwich up. "In some respects Adams is in a 'no lose' situation. If he keeps Norwich up he is a hero - if they go down everyone will blame Hughton anyway." A Norwich statement said: "The decision has been taken to give the club the maximum chance of survival." But they have lost four of their last six league games and have scored just 26 goals all season, despite spending heavily on Ricky van Wolfswinkel and Gary Hooper in the summer. Sections of home fans chanted 'we want Hughton out' during the West Brom defeat, but after the match Hughton insisted he was confident of an improvement in form. "I understand frustrations and it is normal, but we have to understand it is us as a group and everybody is going to get us the results we need," he said. Adams, 48, made more than 200 appearances for Norwich in the 1990s but has no first-team managerial experience, though he did lead Norwich to FA Youth Cup success against Chelsea last season. "People know what this club means to me, and so it goes without saying that we will be doing everything possible to ensure that we maintain our top-flight status for next season," he said. Hughton's backroom staff of former Nottingham Forest and Hibernian manager Colin Calderwood and Paul Trollope have also left the club. Norwich chief executive David McNally said: "Neil Adams is a progressive and successful coach who has served this club as a player and a member of our coaching staff in exemplary fashion over two decades. Celtic manager Neil Lennon is one of the bookmakers' favourites to take over in the long term. However, he told the BBC's Match of the Day 2 that he was not looking to leave the Scottish champions. "It's always flattering to be linked with jobs," the 42-year-old said. "I'm in a stable position at Celtic. I'm at a great club and it's a privilege to be their manager." Norwich's next game is at Fulham on Saturday.